A new campaign to highlight the work of working women photographers and filmmakers has been launched by the The Photography Show. The annual UK show, which takes place this year from 16-19 March in Birmingham, has partnered with a selection of women who work across various areas of the industry, and challenged them to select a piece of work that they have photographed or filmed that makes them feel empowered. Many of the women involved in the Women Who Photo campaign will also lead talks at the show, discussing topics such as creating meaningful images, falling into filmmaking and what can go wrong in photography, alongside a host of technique-based seminars. The show organisers say: "Despite there being a high percentage of female photography students on courses across the UK (often around 80% female to male ratio), the likelihood of them taking their skills to career-level drops dramatically. Those who do pursue their dream career are simply not shouting about their work in the same volume as their male counterparts. This campaign aims to empower both professionals and amateurs to shout about their passion and achievements". The following 15 female image makers will be taking part in the exhibition. Agatha shoots iconic images that promote feature films, and her work has featured on many posters over her eight years working in the film industry. Amy is an automotive and lifestyle photographer based in Leicestershire, UK. Her journalist approach has seen her break into the male-dominated world of car photography. She is also an ambassador for Nikon UK. Founder of She Clicks – a female-only photography group on Facebook where participants can share advice and network. She is the former Head of Testing for Digital Camera World. Carys comes from a production background, having done everything from sound recording, working as a camera assistant and camera operator, to self-shooting PD (producer director). She has worked on science and historical films and on TV productions in the UK for over 16 years. Cat has always had a love of various forms of photography but lacked the confidence to pursue photography as a career. She landed a role as photographer for a community focused National League Rugby Club and with that, further opportunities followed. In 2018, she started taking herself more seriously and last year photographed her first Commonwealth Games in Australia. Emma is a commercial and commissioned professional photographer for marketing teams for corporate industries. She comes from an extensive documentary photography background and trained in Marseille, France in the 1980s. 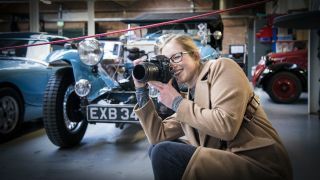 Emma is a Panasonic ambassador and Getty contributor..
Emma is an audio-visual storyteller and the Creative Director at Story Of Your Day, an internationally renowned wedding and event film company. She has worked at the BBC, ITV and Reuters as a TV journalist for 20 years and runs one-to-one videography training sessions and hosts the first videography Facebook group for women in Europe. A self-confessed non-techy photographer, Esther learned on 35mm and carries over her disciplined way of shooting to digital. She specialises in food photography but also covers weddings and social location portraits. She believes in simplicity and not over complicating things and works where possible with available light and wide-open apertures. Holly-Marie is a freelance photographer and filmmaker. Blending a passion for travel, community and street photography, Holly-Marie seeks out authentic stories across the world and in her home city of London. Iulia is a London-based photographer specialising in editorial, commercial and beauty portrait photography. She has done work for Phlearn, NailsInc and Little Mix Cosmetics, and has been internationally published. Iulia is an Interfit Photographic UK Creative pro and teaches both beauty lighting and photoshop high-end retouching. Jennifer began shooting music photography after touring with a band she’d connected with on Twitter at 18. Now 23, her work has taken her all over the world and she enjoys shooting a mix of commercial, editorial and touring work with clients including Reading Festival, Skull Candy Headphones, Fall Out Boy, and Jägermeister. A UK wedding photographer and the founder of SNAP Photography Festival. Laura has photographed more than 200 weddings and her work has been featured everywhere from Hello Magazine to WPPI and in 2016 she was named one of New York-based Rangefinder Magazine's 30 Rising Stars of Worldwide Wedding Photography. Leanne is the UK's leading female wedding filmmaker. Founder of Blooming Lovely Films and the wedding filmmaking festival: Rise, she specializes in destination weddings as well as brand campaigns for high end fashion clients, such as Chanel and Liberty London. Mandy is a leading Asian cinematic videographer. Based in Staffordshire, she entered the industry over 10 years ago and has grown her business and its reputation from ever since. Tesni Ward is a professional wildlife photographer, Olympus Ambassador and Benro Ambassador, based on the outskirts of the Peak District. The images for the exhibition have been printed by CEWE.